It was a beautiful Saturday morning today so I was feeling a bit adventurous and decided to leave Södermalm for my coffee experience. In fact, I had decided a long time ago that I wanted to go back to Saturnus for breakfast. I had been there once for coffee with a fellow Canadian but that was on a working day. It was high time to pay Saturnus a proper visit. I was also hoping that my friend JH would join me but she went out last night and got up a bit late and hungover so she texted me to cancel breakfast at Saturnus. That wouldn’t stop me so I made my way there, decided to have a good breakfast with eggs, bacon and everything else that makes a good breakfast but is so hard to find in Stockholm. Of course, Saturnus is so great that it is always packed and I really did not feel like waiting in line on my own. So I would not go to Saturnus today. It was a beautiful day so I decided to walk around until I stumble on the right café. And this is how I found myself at Humlegården. 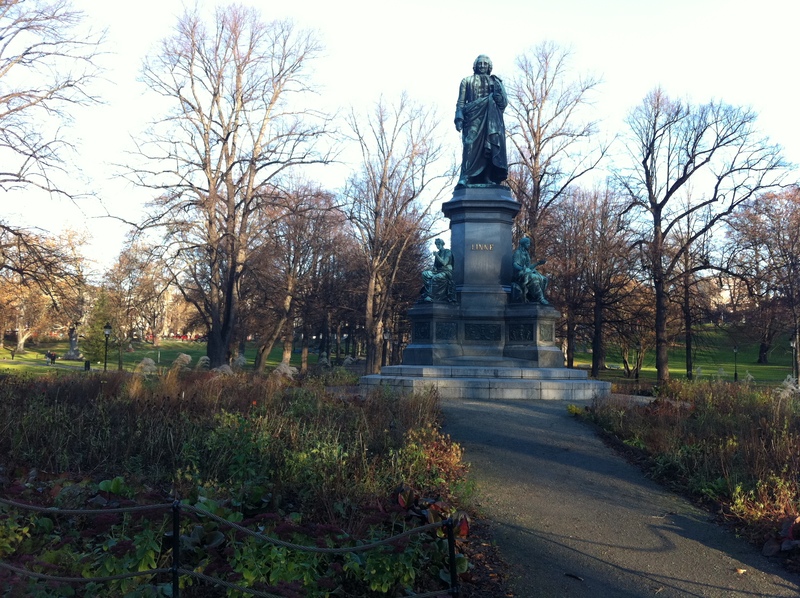 This is a beautiful park with a status of Carl von Linnaeus.That guys lived in the 18th century and the statue was unveiled in 1885. Apparently this was the occasion of a big party and the twinflower that Linnaeus is holding in his hand started appearing on boxes of cigars and booze. As I was walking in the park I realized that I was in my friend RF’s neighborhood and I remembered that he had told me about a date he had the week before at Café Balzac at St. Eriks Plan. Here was my Plan B. I only had to jump in the tunnel-bana and get there as soon as possible. 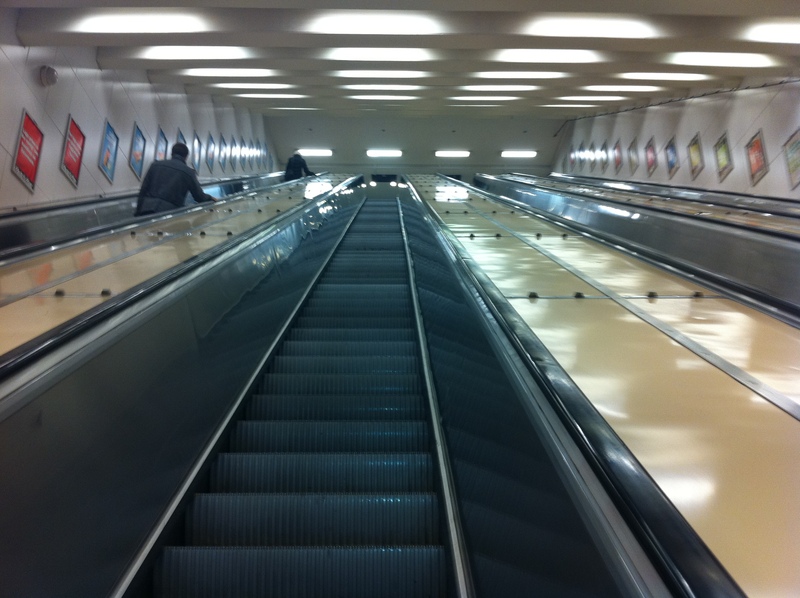 As I was going up the escalator in the tunnel-bana I thought of all those nice photos of the Stockholm’s subway circulating on the internet and realized that I had not seen any of those stations yet. Probably a sign that I need to get out of Södermalm a bit more often. When I walked into Balzac I was pleasantly surprised that nice, cool coffee shops also existed in Stockholm outside Södermalm. Ok, I am kidding. I knew that St. Eriks Plan was quite nice. I just never had time to explore it properly until today. And by the time I got there I was pretty hungry so the first sight when I opened the door was quite reassuring. Sandwiches in the entry.... seen from the way out! 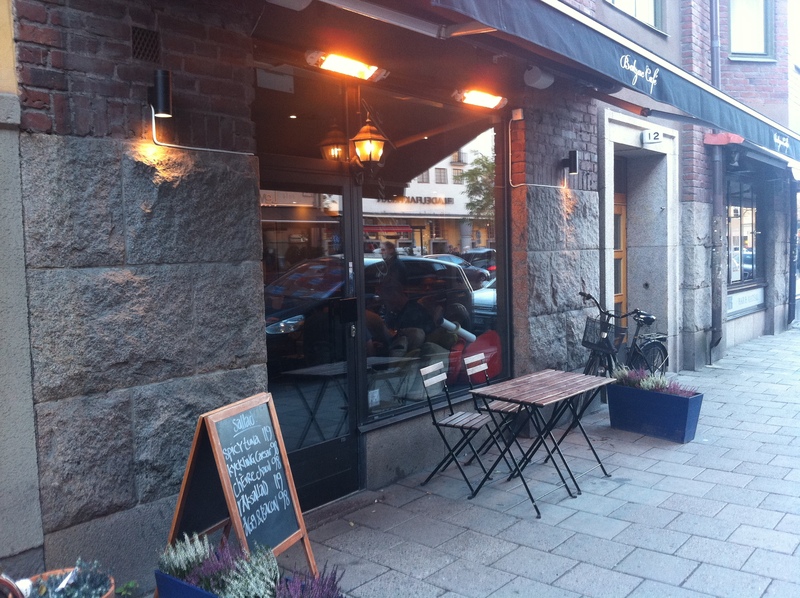 Balzac could be in Södermalm and it would not feel out of place. 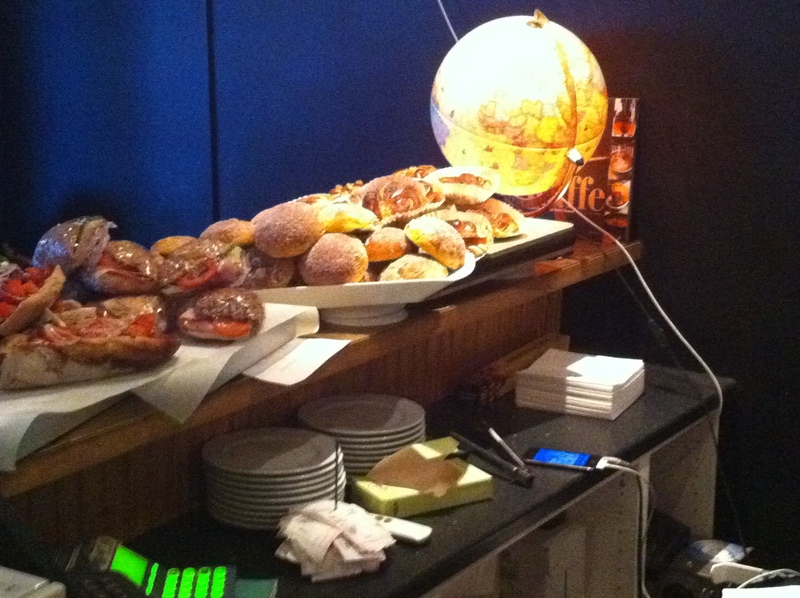 It is a fairly small coffee shops – I think I counted 7 tables – with nice staff and a very warm atmosphere. And in a typical Stockholm way, a few of the customers where new moms who felt it was totally normal to leave their babies in their strollers on the sidewalk. To be fair, those cute moms were sitting next to the window and always had their eyes on the strollers…. 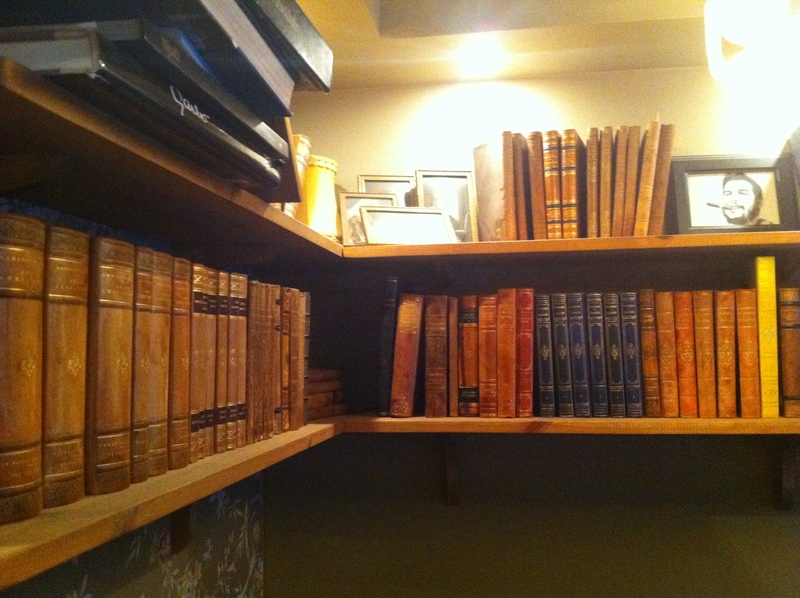 I was sitting in the opposite corner, right under the bookshelves and a photo of the Ché! When I decided to abandon the Saturnus option for today I gave up hopes to have a North American style breakfast and was prepared to eat the typical Swedish sandwich for breakfast. To be fair, some can be really good – remember my hummus-feta sandwich from Franzéns! And I was not disappointed at Balzac! 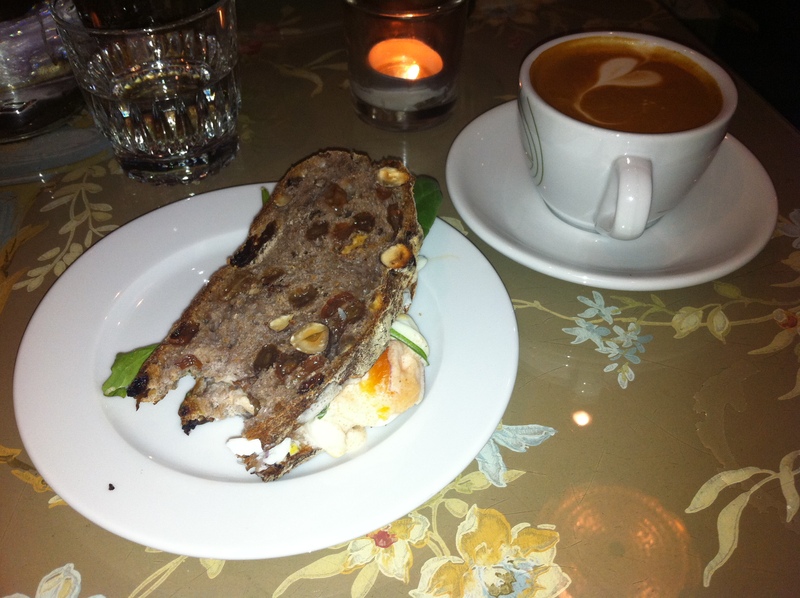 I had this great sandwich with a nut and raisin bread with – guess what? – eggs! Yes, eggs with tomatoes, onions, salad and a wonderful dressing! I strongly recommend this sandwich! This entry was posted in Breakfast, Coffee, Friends. Bookmark the permalink.